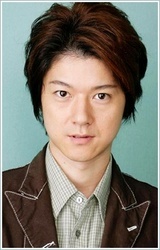 Masaya Matsukaze is an actor and voice actor affiliated with Aoni Production. His acting career began in 1997 when he portrayed Mega Blue in the Super Sentai series Denji Sentai Megaranger. His voice acting credits include Kyoya Ootori (Ouran High School Host Club), Zoisite (Sailor Moon Crystal), Gaelio Bauduin (Mobile Suit Gundam: Iron-Blooded Orphans), Shin Hyuuga Shaingu (Code Geass: Akito the Exiled), Teru Mikami (DEATH NOTE), and Illumi Zoldyck (HUNTER x HUNTER). Game enthusiasts will recognize him as Ryo Hazuki in the Shenmue series, a role he will be reprising thanks to the success of the recent Kickstarter campaign. Mr. Matsukaze will also be starring as Yasuhiro Hagakure in the Danganronpa stage play later this year.